The slides, two video recordings, and one month support for this webinar are available (for a limited time only). 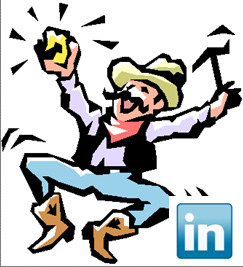 Would you like to learn how to overcome LinkedIn limitations and reach the right people?LinkedIn has a very large collection of business data. However, it is not at all like Job Boards with resumes (even for the top account holders) and, of course, is not like lists of prospects with contact information. Data access and search limitations, the absence of contact information, and “shallow” profiles that lack important data stand in the way of taking advantage of LinkedIn’s full potential. The webinar will be useful for free and paid LinkedIn members alike. Expect to speed up your work, find people you couldn’t locate before, and experience less frustration, more fun using LinkedIn going forward. Some basic understanding of LinkedIn is desirable. The webinar will include a slide show, demos, and Q&A. “Learning about these tips has paid for my whole trip to the conference!” – Mike, an Account Executive at a Telecom company, at a recent Jigsaw conference, after watching some demos. Can’t make the time? We will make a video recording available. The video is available along with the slides and one month of support. You can purchase it here. Made purchase on line – Will this video be sent via email? Yes, you should receive the slides and a link for the video in an email. Is this still available for purchase because the link you shared in your comment redirects to “Nothing found” page.